At our eating disorder treatment center in Los Angeles, our goal is to treat the whole person, address the root cause of an eating disorder and provide patients with ongoing support for a lifelong recovery. Our treatment center serves patients in Los Angeles, Santa Monica, and the surrounding California cities. Located in Los Angeles’ picturesque Santa Monica on California’s coast only minutes from the Pacific Ocean, Rosewood Santa Monica offers personalized treatment for adults and adolescents struggling with anorexia, bulimia, binge-eating disorder and co-occurring mental illnesses. Our Los Angeles eating disorder treatment emphasizes emotional and physical healing from eating disorders and self-destructive behaviors in a healthy, supportive, therapeutic setting that encourages balanced living. Our clients learn to incorporate the proper nutrients, physical activities and holistic approaches to their daily routines to repair abnormal eating patterns and regain control of their lives while receiving eating disorder treatment in California. Rosewood’s multidisciplinary team works closely with patients, their families and referring providers to gain a clear picture of treatment needs and provide continuous updates on patient progress. After performing a comprehensive clinical evaluation, the professionals at our eating disorder clinic in Los Angeles develop a uniquely personalized program for each client that may involve special modalities such as psychotherapy, mindfulness, and dialectical behavior therapy. We offer specialized, developmentally appropriate California eating disorder treatment programming for adolescents and teens ages 12 and up. The program effectively involves families in the treatment process, helps teens reintegrate into their lives, and teaches them how to develop positive coping skills while establishing healthy core values. Learn more about our adolescent and teen program. Our Los Angeles eating disorder treatment program is an innovative option for those who are medically stable with severely impaired functioning due to eating disorders and co-occurring symptoms. This 11-hour structured program is also beneficial for those who need more than a standard partial hospitalization program, but less than residential. Our Partial Hospitalization Program is for those requiring a higher level of structure, attention and support. Treatment at our Los Angeles eating disorder treatment center involves a nutritious lunch, snack and dinner as determined by a pre-developed individualized meal plan. Individual, group, and family therapy sessions are tailored to the needs of the client as clinically indicated. The program psychiatrist is available for psychiatric consultation and for the treatment of co-occurring disorders. Our Intensive Outpatient Program is held Monday through Saturday evenings in the Santa Monica area of Los Angeles. Each 4-hour session may include specialized groups, nutritional meal planning, supervised meals, meal processing and educational presentations to support the recovery process. We also offer group psychotherapy, body image group, gentle and mindful eating, process groups, and experiential therapies. We offer transitional living programs at two beautifully appointed and compassionately supervised homes in the Los Angeles area. For adults only, each of our homes focuses on a specific phase of eating disorder treatment. Each resident benefits from therapists, recovery tools, community bonding, one-on-one support from our resident advisors, job search support and recovery tools. Family involvement is a crucial part of our eating disorder treatment in Los Angeles. Working as a team we prepare patients, family and friends with the essential tools they need to return home with confidence and a commitment to live healthy and productive lives together. We address family issues, provide information on communication, the recovery process and lay the foundation to mend the family system. Our Los Angeles dietitians understand the true essence of intuitive eating, by empowering our clients to listen to their body’s cues as a way to naturally guide eating. Rosewood Santa Monica highlights the importance of reconnecting the mind-body experience through mindful eating practices with the purpose of becoming aware of biological hunger versus emotional hunger, as well as the environmental factors that influence eating. Our California eating disorder treatment center offers various experiential modalities led by certified therapists, registered dietitians and psychiatrists. Each individualized treatment plan incorporates any of the following: dialectical behavioral therapy, cognitive behavioral therapy, body image groups, addiction and psycho-education, meal planning/ nutritional education, relapse prevention, gentle and mindful eating groups, multi-family therapy groups, individualized case management, art/ music therapy, yoga, equine therapy and bibliotherapy. Our Los Angeles eating disorder clinic hosts a variety of weekly support groups with topics designed for clients, as well as their families and friends alike. 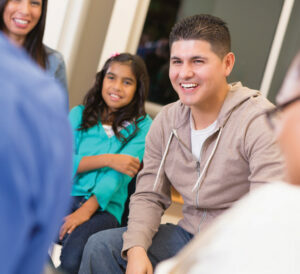 These groups allow individuals to share their experiences, exchange information and connect with others who may be experiencing similar situations. Individual therapy is also provided and emphasizes insight, self-awareness and empowerment to help each client to learn about themselves and grow. 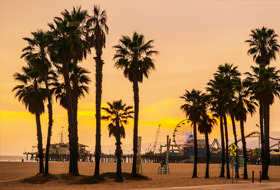 Our treatment location in Santa Monica is right next to the Santa Monica airport and convenient to Inglewood, Torrance, Beverly Hills, and the downtown Los Angeles area. If you are coming to our location from Los Angeles, the most direct route is to take CA-110 to I-10 W and exit off 2B to Bundy Drive S. When you exit, take a right onto Bundy Drive and turn right on Ocean Park Drive. You will see our location on the right.